No. 1007 is an electrically-heated, 500º F (~260ºC) top-loading oven from Grieve, currently used for curing composite components. Workspace dimensions are 26-1/2’ wide x 2’ deep x 2-1/2’ high. 60 KW are installed in Nichrome wire heating elements and three (3) 3-HP recirculating blowers total 9000 CFM to provide horizontal rear-to-front airflow to the workload. 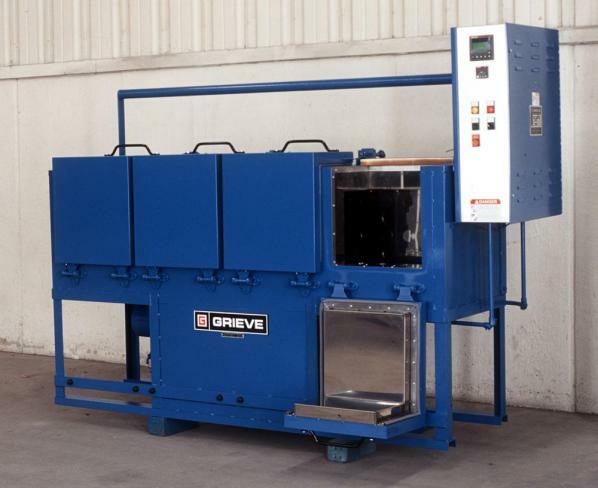 This Grieve top-loading oven features 4” insulated walls, aluminized steel interior and exterior, motor-operated rear-hinged door and compressed air manifold with eight connections. The unit meets NEMA 12 electrical standards, while the floor of the workspace is reinforced for 5000 lb. loading to support the customer’s fixtures. Controls onboard No. 1007 include a digital programming temperature controller, 16-point strip chart recorder and tower light to indicate machine status. No. 1012 is an electrically-heated, 500ºF (~230ºC) top-loading oven from Grieve, currently used for testing electronic equipment. 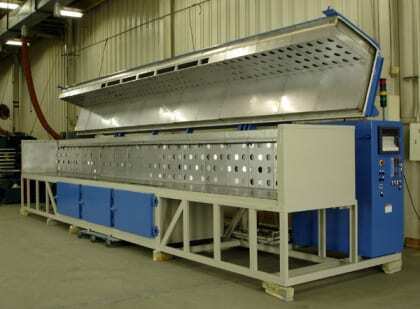 Two zones, each 96” wide x 12” deep x 12” high, can be separated for use as independent ovens. 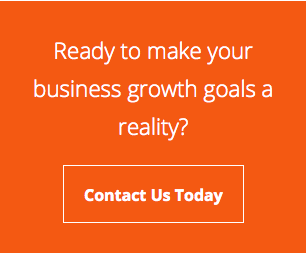 24 KW (12 KW per load) are installed in Incoloy-sheathed tubular heating elements and two 1/3-HP recirculating blowers provide a total horizontal airflow of 1200 CFM to the workload. This Grieve top-loading oven features 4” insulated walls, aluminized steel interior and exterior, manually operated rear hinged door, reinforced flooring that can accommodate a load up to 500 lbs. and swivel casters with swivel lock and wheel brakes. Controls onboard No. 1012 include a digital indicating temperature controller, manual reset excess temperature controller with separate contactors and recirculating blower airflow safety switch. No. 1004 is an electrically-heated, 500ºF (~260ºC) top-loading oven from Grieve, currently used to heat weldments at the customer’s facility. Workspace dimensions measure 64” W x 48” D x 48” H. 45KW are installed in Incoloy sheathed tubular elements to heat the unit, while a 3000 CFM, 2-HP recirculating blower provides horizontal airflow to the load. This Grieve oven features 4” insulated walls, aluminized steel interior and exterior, reinforced 1/4” steel plate top, air-operated rear-hinged door, wear bars at the sides of the workspace and a floor reinforced for 5000 lb. loads at the removable subway grate. Controls on No. 1004 include a digital programming temperature controller, manual reset excess temperature controller with separate contactors, recirculating blower airflow safety switch and fused disconnect switch. No. 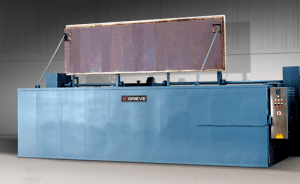 802 is an electrically-heated, large capacity top-loading oven from Grieve, currently in use drying water from spinnerette packs. This unit has a maximum operating temperature of 500°F and workspace dimensions of 13’6” W x 28” L x 24” D.
A 100 KW heat input is installed in Incoloy sheathed tubular heating elements, while a 4,200 CFM, 3 HP recirculating blower provides horizontal front to back airflow across the load. This large capacity Grieve oven features 4” insulated walls throughout, an air-operated door, reinforced 1/4” steel plate top, wear bars at all sides of the workspace and a reinforced floor for 3000 lb. loading at the removable subway grating. No. 802 also includes a digital indicating temperature controller, manual reset excess temperature controller with separate contactors and a cycle timer. No. 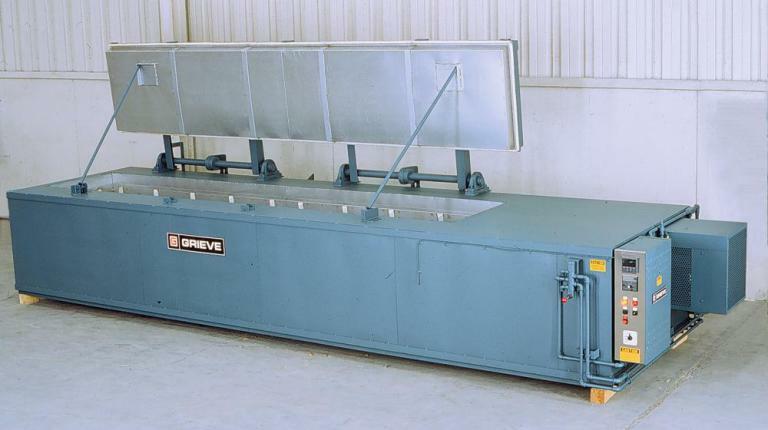 955 is a 500ºF (~260ºC) electrically-heated, top-loading oven from Grieve, currently used for testing electronic components at the customer’s facility. Workspace of this unit measures 312”W x 24”D x 24”H. 70KW are installed in Nichrome wire elements to heat the oven, while 8000CFM total from a series of four 2HP recirculating blowers provide horizontal rear to front airflow to the workload. 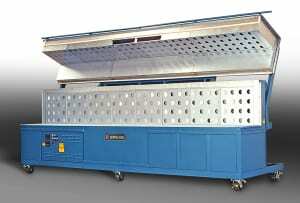 This unique top-loading oven has 4” insulated walls throughout, aluminized steel exterior and interior, a motor-operated rear-hinged door opening the top and front of the oven chamber and a workspace floor reinforced for 7200 lbs. loading onto the 1/4” steel plate surface. No. 955 features a digital programming temperature controller with two channels providing two independent zones of temperature control. The oven also has onboard two manual reset excess temperature controllers with separate contactors and four recirculating blower airflow safety switches. No. 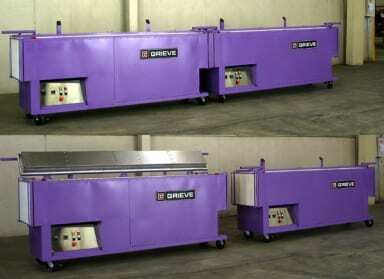 984 is an electrically-heated, 500ºF (260ºC) custom-designed top-loading oven from Grieve, currently used for curing connector assemblies onto long cables at the customer’s facility. Workspace dimensions measure 72” W x 8” D x 14” H. 12KW are installed in Nichrome wire elements to heat the unit, while a 600 CFM, 1/2 HP recirculating blower motor provides rear-to-front airflow across the workload. This Grieve top-loading oven features 4” thick insulated walls, aluminized steel exterior, Type 430 stainless steel interior, four independently hinged doors to expose the front and back of each loading station, steel plate oven floor and a workspace floor reinforced for 100 lb. loading on 1/4” plate. Controls on the No. 984 include four special automatic door switches to shut off blower and heat when any door is opened, plus a digital programming temperature controller, manual reset excess temperature controller with separate contactors and recirculating blower airflow safety switch.